Widely regarded in his home country as one of the greatest players of all time, No.8 Doug Hopwood was an inspirational figure on South Africa's 1960-61 Grand Slam tour of the Home Unions. 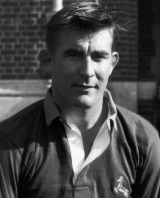 Born in Cape Town and a servant of Western Province at Currie Cup level, Hopwood made his international debut against Scotland in 1960 after a stint in Argentina with the Junior Springboks. Later in his first year as a Test player, Hopwood played two Tests against the All Blacks before embarking on tour. His performance in victory over Wales was lauded far and wide as his desire overcame the torrential conditions, with John Billot noting in his book Springboks in Wales, "No forward of any country had ever played more selflessly." A persistent back injury, the result of a weight-lifting accident, left him in hospital following the game but he recovered to play a full part on tour, scoring tries against England and Scotland. He played in a victorious Test series against the British & Irish Lions in 1962. In 1965 he was controversially passed over as skipper of the Springboks to tour New Zealand, having earlier been vetoed as captain of a doomed northern hemisphere tour, and played his final Test against the All Blacks in Auckland as they lost the series.